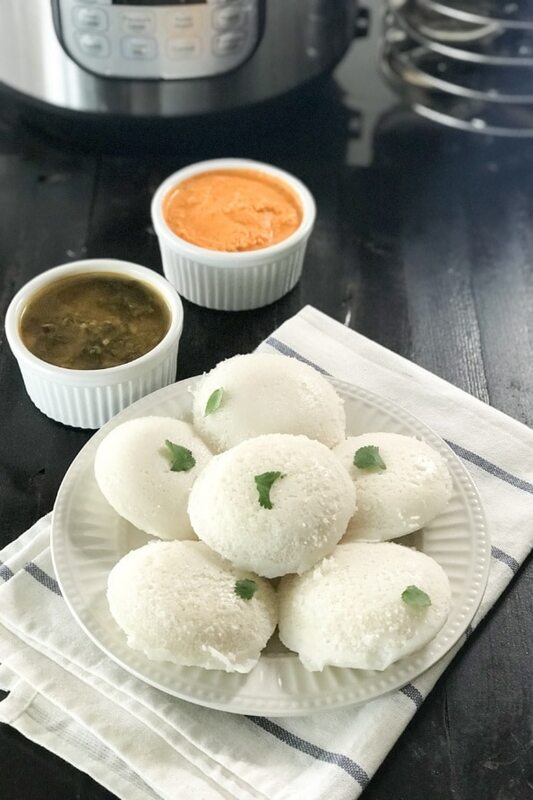 Here’s an Instant Pot Idli Recipe with step by step pictures. If you felt that my Neer Dosa recipe was simple, here’s yet another simple recipe that you will wish you knew earlier! Idli is a common south Indian delicacy and a predominant breakfast option for a lot of people. I plan to show you how you can prepare this with the Instant Pot. Not just cooking them but also preparing the batter with this little kitchen gadget. 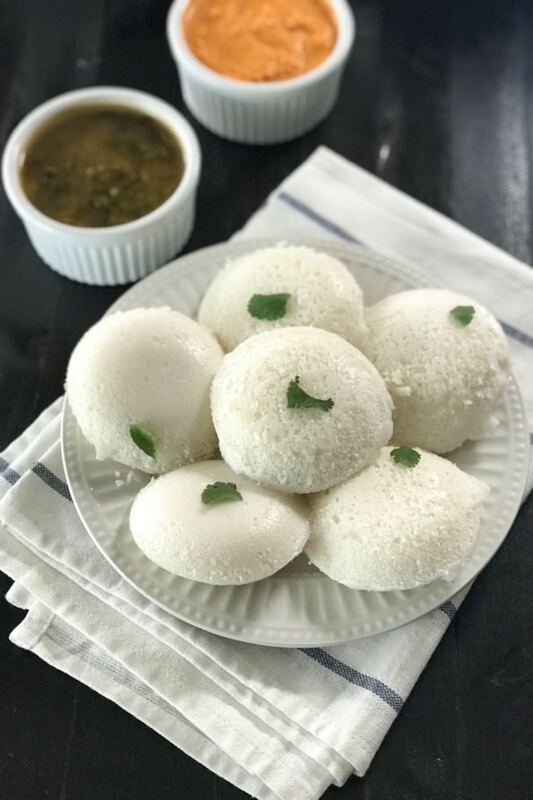 Idli is a soft and healthy steamed cake made with fermented rice and lentils. As I said, this is a traditional breakfast option in south Indian homes. Idli is also known for its nutrition and the ease with which it is prepared. A little bit of preparation goes a long way in cooking Idlis and you can also prepare a bunch of them in one sitting. That makes it a great option if you are entertaining a group of 3-4 or even more. Idli batter is made with 2 ingredients: Rice and Urad Dal. 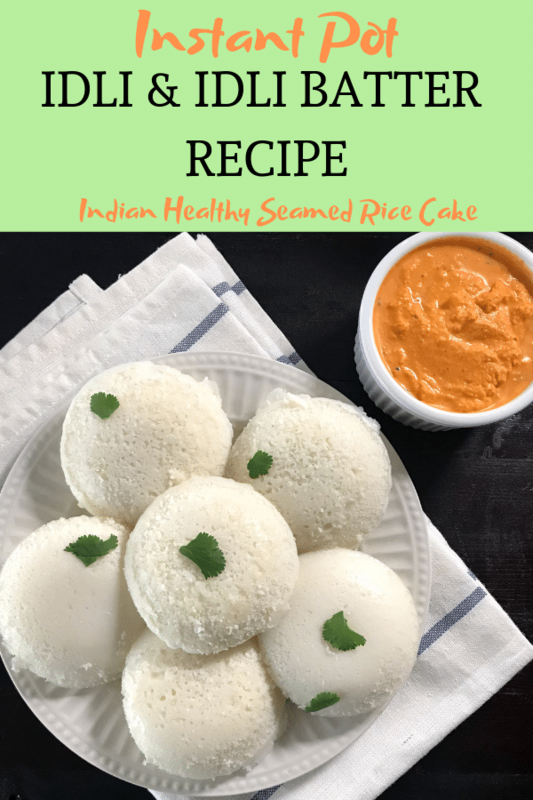 For this recipe, I used parboiled rice that is sometimes tagged as idli rice and whole Urad dal (instead of the split variety). However, you can make idli batter using raw rice too. All white, long grain rice varieties (Except basmati) are best suited for this recipe. The procedure for making idli batter is as simple as soaking and the ingredients and blending them to a fine consistency. In traditional Indian homes, using a stone grinder is common but any blender is just fine as long as the final consistency is smooth. Idli rice and urad dal are soaked in separate bowls for 4-6 hours. By then the grains would have become softer, plumped up and ready for grinding. First blend just the Urad dal with a little water. This makes a fine and fluffy batter. Set that aside in a bowl and grind the rice with just a little water. 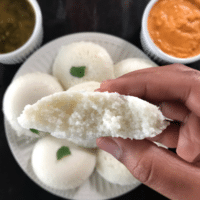 The rice can be a little coarse depending on the texture you prefer in your Idli. Be sure to use a sufficiently large bowl to mix the batters because it doubles in volume as it ferments! Just leave it covered in a warm place to ferment for anywhere between 8-12 hours. The time depends on room temperature. The warmer it is, the faster it ferments. How To Ferment The Batter In Instant Pot? 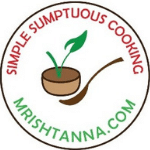 Today I am sharing one more method of fermenting Idli batter using the Instant pot. Yes, you read that right…you can ferment batter in instant pot. You could also check out my Instant pot dosa batter here. Mix the rice and urad dal batter very well. Add salt and mix thoroughly using a wooden spatula. Place the batter in the inner pot and place the Instant pot in “yogurt” setting for 9 hours. NOTE: Do not close the Instant pot lid. Use a lid to cover that lets a little air through. In the 9 hours, the batter would have become lighter and doubled in volume as it ferments and you can tell that from the smell too. 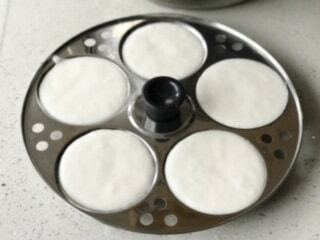 Now you are all set to cook the batter for some soft and tender Idlis. Usually, fermented idli batter is steamed in an idli pan in 15- 20 mins. The pan is usually greased lightly before pouring on the batter. 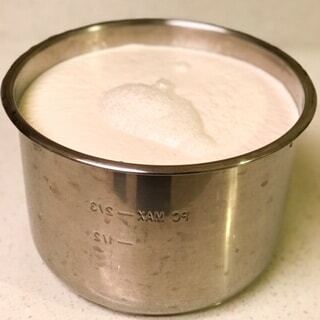 Stove Method: Place the Idli pan in a steamer without a pressure seal. The sweating from the steam is enough to cook the Idlis in 15-20 minutes. Instant Pot Method: Add 1.5 cups of water to the instant pot and let it boil in Saute mode. Place the idli stand in the instant pot and cook it in a steam mode in the venting position. The thing to note is that the timer function on the instant pot does not work in the venting position. So you have to use a separate timer and set it for 12-14 minutes. I tried this method for rava idli also & again got inspired by Pipping pot curry! Idli can be served with coconut or tomato chutney. Check my recipes for those too. It is also very common to pair idlis with sambar or chutney powder (with a little coconut oil). Idli batter has a decent shelf life. It can be refrigerated for 2 -3 days. However, let the batter come to room temperature before you cook them on the stove or in the Instant Pot. If this recipe interests you, look for similar recipes in my blog such as the Rave Idli. For more delicious vegan recipes such as this sent directly to your inbox, just subscribe to my newsletter. You will also get a copy of my e-book where I have put together some simple vegan dessert recipes and dessert essentials. My readers have found it very helpful and I am hoping you will too! Idli is a common south Indian delicacy and a predominant breakfast option for a lot of people. I plan to show you how you can prepare this with the Instant Pot. Not just cooking them but also preparing the batter with this little kitchen gadget. Wash the dal and rice in clean water, and soak them in separate bowls for 4-6 hours. Strain the water and blend the rice and dal separately adding just a little water. Mix the dal and rice batter very well and add salt. Press the yogurt setting in Instant Pot and let it sit for about 9 hours. Idli batter will be fermented and ready for cooking. Gently stir once. Transfer the fermented batter to a bowl and add water to the (cleaned) inner pot and turn on the saute mode to boil the water. 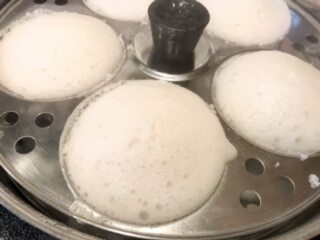 While the water is heating, grease the idli molds with oil. Add a small amount of batter in each mold and stack them in Instant Pot. Close the lid and keep the Instant Pot in a steam mode in the venting position. The timer function on the instant pot does not work in the venting position. So you have to use a separate timer. In 12- 14 minutes, Idli will be ready. Repeat this for remaining batter. Hot Steaming Idlis are ready to be served! Pair them with coconut chutney or sambar for a delectable experience. IMPORTANT: Normally it takes anywhere from 9-12 hours for the batter to ferment naturally, in warm temperatures. Use Instant Pot for fermenting batter during the winter. My Insta Pot does not have yogurt feature. Can I use another feature that would help me ferment my batter. Thanks. Hi Khush. You can ferment the batter using an oven. Preheat oven for 10 min, then off and keep inside with light on. I don’t know any other feature in IP. Hope this will help you.